Jeri Ellsworth has had time for new exiting projects, and one of them is headed to Kickstarter soon. 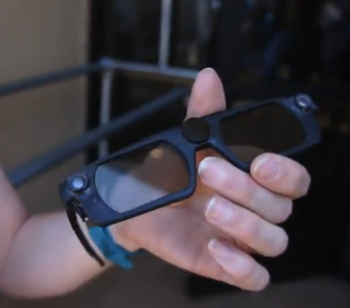 "It's like a magic wand," says ex-Valve tech guru Jeri Ellsworth, as she demonstrates her latest augmented reality glasses build at Maker Faire 2013. With the glasses, wand and LED-enhanced reflective screen, "you can interact with these graphical things in the real world as if they're really there," she says. It's the device Ellsworth has been working on since her departure from Gabe Newell's workshop, and she's hoping to take it to Kickstarter in 2013. The glasses, with its projectors, tracking camera and LEDs - able to figure out head position with submillimeter accuracy at 3 meters distance - and the special reflective screen help create the augmented reality illusions, bouncing images projected out of the glasses to the surface at 120 Hz refresh, while the wand allows the player to interact with them. "Each person wearing the glasses has a unique view on the situation," says Ellsworth, making the device perfect for multiplayer matches. Ellsworth hasn't got a firm price, and is currently at the prototype stage, but is pitching the package at under $200. It all started at Valve, when Ellsworth and her friends worked in Newell's hardware shop. "We started researching everything games," says Ellsworth, "and then the group split off into different directions," each pursuing their own goal. Ellsworth wasn't that big into AR at first, but after she saw the potential of the tech she became a firm believer. Unfortunately the hardware project didn't fit with Valve's idea of where future potential products lay, hence the layoffs. "A group of us are now working outside of Valve," says Ellsworth, "with it's blessing. [Valve] has given us this tech." Now Ellsworth, with her new company Technical Illusions, just has to make it work. So far, so good, at least at Maker Faire.